A good way to use the MAP™ is with groups of people in your organisation who have a vested interest in mentoring. 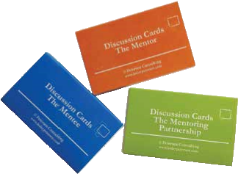 Given the set of attribute cards and a poster, the groups have to decide the five priority interpersonal qualities and five professional skills and knowledge that mentors need to possess. Through discussion and debate as each group presents their choices, a final MAP is created by consensus. This exercise generates plenty of discussion about what are the core attributes you are looking for. The final decision made by the group then establishes the organisational criteria for mentor selection.